Fulham striker Kostas Mitroglou has left the club on a season-long loan for a second time after agreeing a move to Benfica until June 2016. Mitroglou joined Fulham from Olympiakos for £11m in January 2014, but has made just one start and two substitute appearances without scoring a goal. The 27-year-old rejoined Olympiakos on loan last season, scoring 19 goals in 32 appearances. "I didn't think twice when the opportunity arose," said Mitroglou. "I will try to score many goals for the team but the most important is to win the games. Of course, the goals are important for a striker and I am happy to play here." 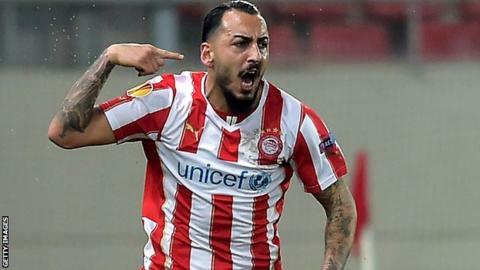 Mitroglou won the Greek title and Greek Cup with Olympiakos last season, the 10th and 11th major trophies of his career. Meanwhile, Buomesca Tue Na Bangna has also left Fulham to join Cypriot side AEL Limassol on a permanent deal.